It’s not a card – it is not a home decor item – it’s desk decor. A little bit of color to brighten up the office during the winter. All of the machine cuts on this desk decor item are from Curt Jensen @ Provo Craft. 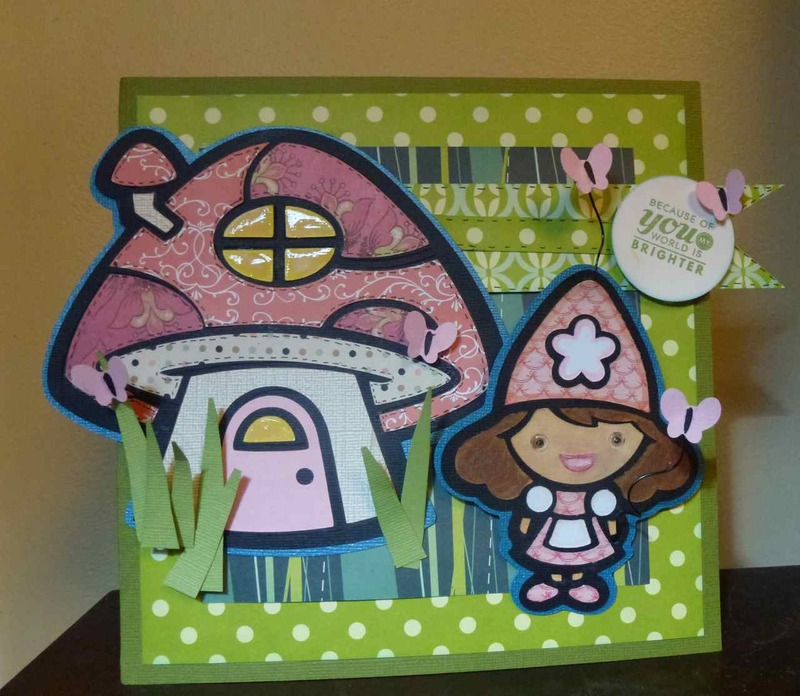 The gnome and her mushroom home are from a new digital Cricut cartridge release titled “Gnomes and Mushrooms” and the butterflies are from Campin’ Critters. The blades are grass are hand cut and the sentiment, from Paper Trey Ink, is a 1.75 inch circle punch. The base of this project measures 8×8 and it stands due to a Tim Holtz easel attached to the back of the base – and can I just say, it is a fabulous thing. My sister gave me a few pre-cut stands for Christmas, and now I absolutely need to buy this die. The Gnome: Cut at 4.5 inches, her mouth and eyes were colored with Copics and given a nice coat of Glossy Accents. The gnome is attached via an Action Wobble so it is an interactive desk decor item. The butterfly extending from her hat and hand are attached via a thin black covered copper wire that I found in the jewelery section at the craft store. When she wobbles, her butterflies accompany her. Her Mushroom Home: Cut at 5.5 inches, the windows and door window were highlighted with Copics and also got that fabulous Glossy Accent coat. Butterfly: From the frog2 cut (layer1 and layer2) and cut at 2.25 inches. This was part of my continuing voyage of discovery using Cricut Craft Room, and I have to admit it is growing on me. Love the glossy accents on the face. What am I most impressed by? How incredibly sweet and springy this project is? The fact that you make desk decor? (brilliant) The fact that you are using CCR? The fact that you are using digital carts? Adorable project! Love the dimensional grass and the patterns you have put together. You and those action wobbles! So the stands are cut from a die? I need that too!!! This is adorable. I wish I had thought about this one for my recent mushroom project. I just love that it has windows and doors. Makes it more magical….especially with that adorable little gnome resident standing by. I am so glad you are using CCR. I love CCR. I am trying to talk some friends into trying it, but they are having no part of it. Don’t get me wrong, it has a few frustrations, but what in life doesn’t?! I hope you are entering this in the magazine challenge. You totally need to! I adore the papers you have put together on this. And the idea of the gnome wobbling with all her butterflies is such fun. I’d never get any work done if it were on my desk…I’d be too busy wobbling my gnome. 🙂 Try explaining that one at the water cooler. I picked up a couple of 8 x 8 shadowbox frames on clearance a few months ago with the intention of making some scenes for them. After seeing this, I want to dig them out from the stuff I have lovingly placed (ok, shoved) under my drafting table and play. Like a scene straight from a fairy tale. Love what you have created. OK, I AM NOT A ‘GNOME/MUSHROOM’ TYPE OF GIRL, BUT YOU WON ME OVER WITH THIS PROJECT!!!! IT IS SO CHEERFUL AND FUN; AND ABSOLUTELY TAKES AWAY THE WINTER BLUES!! I LOVE IT! Sis – This is so cute! I love all of the patterned papers that you used. And the addition of my Campin’ butterflies was genius! I can’t wait to share this on my blog. That is sooooooooooooooo cute! Glad I finally convinced you to get the easel :D. Love that wobble! Is the sentiment on the circle a stamp?